You are here: Home / Blogs / Out of the Box / Merry Christmakwanzukkah! 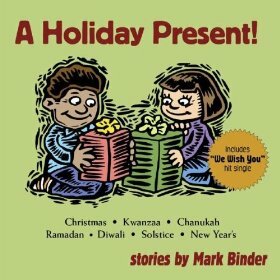 I have to admit, my initial response to Mark Binder’s CD A Holiday Present! Christmas, Kwanzaa, Chanukah, Ramadan, Diwali, Solstice, New Year’s (Light Publications) was unenthusiastic. The carefully non-denominational cover illustration and the tagline “Warm, joyful, and fun adventures celebrating giving and family” had me bracing for some seriously touchy-feely PC crap. Includes “We Wish You a Merry Multicultural End of Year Holiday Season” hit single? Gimme a break. I was relieved to discover that this collection of family-oriented holiday stories ranges from silly to thoughtful, with just a hint of subversion. Binder explains his inspiration for the song “We Wish You…” with the story “The Little Drummer Boy Medley,” in which he and his Christmas-abstaining family suffer through a seemingly never-ending Xmas muzak medley — on the day after Thanksgiving. “And they didn’t even do the David Bowie and Bing Crosby version!” Some tales (like “The Gold Coins”) have a traditional feel about them; others (e.g., “The Boy Who Hated Potato Latkes”) are clearly Binder originals. Plenty of wacky voices and places to chime in will engage little listeners. Just as important: adults can listen with kids without being hit over the head by morals or contracting deadly Raffi-itis. >But will the book still make sense on years when Ramadan falls in July? >@Anonymous: I think it works. Binder does say Ramadan is on a lunar calendar and moves through the year. And the single Ramadan story ("My House Is Too Small for Ramadan") is not particularly Ramadan-centric: a man goes to a wise-woman for advice because his house is full of family for the holiday and it's making him crazy. It could just as easily be a Christmas or Hanukkah or Kwanzaa tale. >@anonymous I have the CD and it works as do all of marks CDs. If your concern is holiday related then try one of his others. My kids, ages 7, 11, and 13 love them! We've been avid listeners for years.